Researching wedding technology trends can be both, helpful and useful in planning your big day. One new wedding technology trend is to ban all cell phones and electronics at the actual wedding ceremony. This policy will help foster a distraction-free environment at your ceremony and will keep your tech-loving attendees at bay. One method of implementing this trend is having someone collecting phones and other electronics from wedding guests at the door of your ceremony and storing them somewhere safe (make sure you mention this policy in your invitation so there’s no surprise for guests). You can also just make it clear your ceremony is electronics-free and trust that your guests will follow your rules! 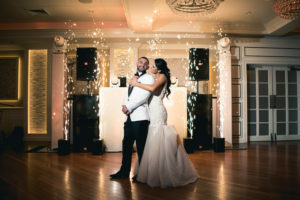 An incredibly cool effect to make your wedding extra special is to use dry ice to make a cloud of fog made from dry ice surround you and your beau as you perform your first dance. Clouds will fill the dance floor as you two dance, creating an elegant and timeless effect at your wedding reception. Not only will your guests be in awe of the dry ice, but your wedding photos will turn out incredible! Implementing social media into the wedding day has been a big trend lately and can help make it easier for you and your loved ones to share memories of your special day. Come up with a hashtag where your guests can share photos taken at your wedding. But, make sure the name is specific, not just you and your partner’s name. This way, all the photos your friends and family post won’t get mixed up with pictures from another event. 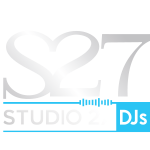 Ask our Studio 27 DJs about displaying photos posted on the hashtag at your wedding. Photo booths are the perfect way for your wedding guests to capture memories that they can take home with them. This has been a wedding trend for years and it’s still just as fun! Plus, with updated technology, photo booths are becoming easier to use and more advanced.